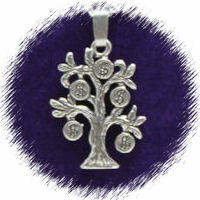 The Money Tree necklace is a sterling silver pendant of money bags hanging from a tree on a 925 silver chain. The money bags are marked with dollar symbols. The pendant is 20mm high, 16mm wide, 2mm deep and 2.5g in weight. You can choose between different chain lengths.